Qualcomm has announced the Centriq 2400, noting that it’s the first server CPU in the world to be built on a 10nm process, and one that could be a worry for Intel and indeed AMD, particularly given other recent developments in terms of Qualcomm hooking up with Microsoft over Windows and ARM. At any rate, this new processor is designed for speedy performance in the data centre, and the Centriq 2400 is built around a custom ARMv8 CPU core (called Falkor) optimised for server workloads, offering up to 48 cores. As well as delivering on the performance front – and outdoing the dominant force in server chips, Intel, by racking up a far bigger core count, and of course reaching 10nm first – Qualcomm also promises impressive power efficiency, which is naturally a must for the data centre environment. The company said that Falkor has been designed from the get-go to be SBSA (Server Base System Architecture) compliant, meaning software which runs on any ARMv8 server platform will run on a Centriq 2400-based server. Qualcomm said that the new chip meant it was “uniquely positioned to address the needs of cloud customers seeking new server solutions optimised for total cost of ownership, while meeting performance, efficiency and power demands”. And the company has already demonstrated Apache Spark and Hadoop on Linux and Java running on the processor. 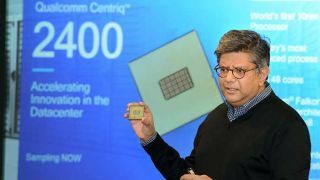 Qualcomm says that the chip is currently sampling to key customers and will be commercially available in the second half of next year. As we already mentioned, Qualcomm has also been in the limelight due to the emergence of news of a big partnership with Microsoft, which means that desktop Windows 10 will be coming to ARM in the form of Qualcomm’s Snapdragon CPUs. Hence we can look forward to a new class of ‘mobile PCs’ going forward, and given the progress Qualcomm is making these days – and looking at the innovation on board these new server processors, for example – there are likely to be some furrowed brows at the offices of the big desktop chip makers.